16 June - It has been far too long since my last Pond Diary entry so I am going to start making up for lost time with a long entry to cover the last week. First of all there are two water plants in flower now. 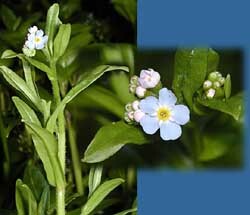 The first one is the Water Forget-me-not (Myosotis scorpioides - I think). 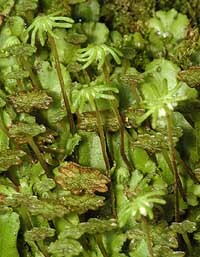 The submerged leaves of young specimens of this plant seem to be a favourite place for the newts to lay their eggs. 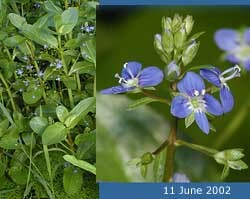 Confimed to the small pond because it spreads very quickly, the Brooklime (Veronica beccabunga) started flowering while we were in Cornwall. 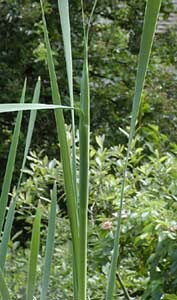 On a rather different scale to the first two plants, this year we are going to have four reedmace flowering heads. They are not yet fully developed, but the one pictured here is already over 7ft tall! The Bur-reeds have been coming into flower over the last couple of weeks. Male and female flower inflorescences share the same stems. 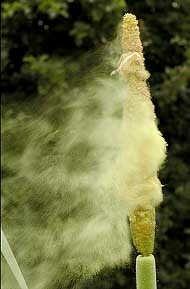 The main picture shows the plant in the early stage of flowering, when the female flowers are evident with their white feathery stigmas. The smaller male flowers appear as small spheres higher up the stem. 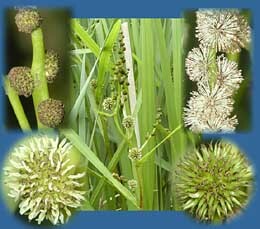 The right hand images show how things are reversed later on as the fertilised seeds develop in a spiky green sphere while the male flower heads have ripened to create white stalked clusters, releasing pollen to fertilise other Bur-reed plants. 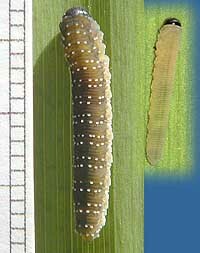 There are a number of larvae living on the Iris leaves in the big pond. There are only a few of these so, although they seem to have a good apetite little damage is being done to the plants. I have not been able to identify them so far. They are not caterpillars and the leg count suggests thay could be sawfly larvae. The pond surface is now completely covered with plant growth but underneath that cover the water is teeming with life. In the next weeks I hope to have time to record a cross section of what is there. To start with, bit of pond dipping with my Ferrero Roche container ( a good excuse to buy some chocolate as the containers make excellent mini aquaria!) came up with this small water beetle. 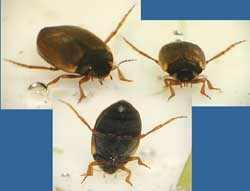 Its size (<5mm long) and plain brown colour suggests that it may be Noterus clavicornis. The same session turned up this tiny hawker dragonfly larva. On 1 Sept last year I photographed a Southern Hawker laying eggs in moss on the log in the centre of the pond. 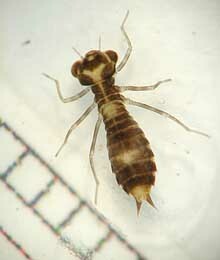 However, this larva's shape at this early stage suggests that it is from a different family (Libellulidae). The scales used in the next few pictures show millimetres. The newts are obviously still egg laying, as I have found numerous eggs in just a brief period of exploration. 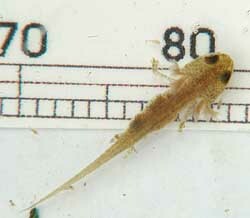 In the meantime, nearly every scoop of water that I looked into had one or more developing newts in them. This first one had only recently 'hatched'. 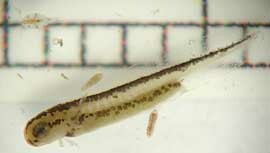 Others, like this one, have already reached the stage of developing legs. The hind limbs are only just appearing. In the first newt picture you may spot the cyclops larva in the top left corner of the picture, conveniently positioned over the scale. While lots of activity goes on under the water, the surface also has a fair amount going on. There are lots of small flies of various species on the surface plants and I will take a close look at some of these in the next day or so. Where there are flies there are hunters. The main ones are the frogs and the pond skaters. These have already produced young this year and the picture shows a adult and a juvenile. The number of frogs in the two ponds has hardly diminished since the Spring and, in addition, there are adult and juvenile frogs everywhere in the garden now, although there is no sign of any of this spring's brood being anywhere near ready to join them yet. Grass cutting has to be done with great care. 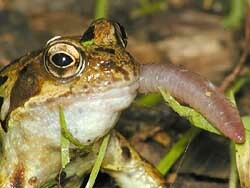 This frog was quick to pounch on a worm that was disturbed by my activities as I tidied the garden. The liverwort patch at the base of the log in the pond is really thriving this year. Its leaves have spread and it is now covered with a forest of umbrellas as it reproduces. The shorter, brown edged umbrellas are the male organs that produce (unusually for plants) sperm. The taller, palm-tree like structures are the female organs. For more details look at the June entries in last year's pond diary. 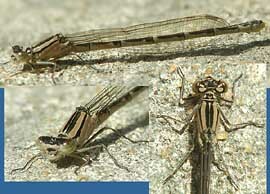 17 June - Today has been a very warm, sunny day, and it has brought my first sighting of a damselfly this summer. It was egg laying, but it chose to do this partly hidden from view so these are the best images I could get of it before it left. 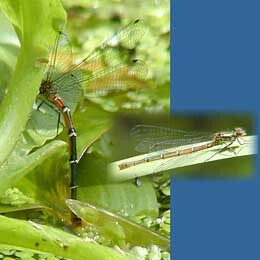 The right hand image was taken of the damselfly on a leaf that was bouncing in the breeze. I have not yet managed to identify it. 18 June - Another very warm, largely sunny day and first thing in the morning I spotted this damselfly 'sunbathing' on the concrete drive. As the shadow indicates it was facing directly towards the sun. I have not identified it yet. The first reedmace has now reach the stage where its immature flower head is exposed. The main picture is made up of four images pasted together. The right hand image shows a closer view of the male inflorescence. A bit of a mystery this one. This pupa(?) 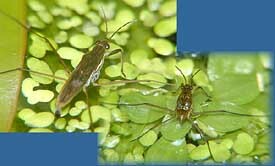 has appeared on a bur-reed leaf in the pond - I do not know what it is. The little spider has taken up a position just below it and remained there all day. Tonight it has built a web across to an adjacent leaf. 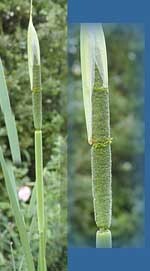 22 June - Today the first reedmace to 'flower' started to shed pollen in the breeze. However, because the breeze was somewhat unreliable,I have to confess that to get this shot I needed the help of Sheila who tapped the stalk gently while I perched on top of a step ladder. The ladder was needed as the flower head is over 7ft above the water. 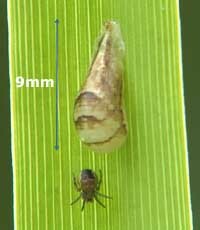 A note about the picture of the pupa and the spider - I could have taken exactly the same photograph again today as the spider continues to use the same spot throughout the day. 23 June - The log in the big pond has become home to some digger wasps. I spent a bit of time watching them this afternoon, and managed to grab a couple of images. The opening to the burrow is just about the wasp in the main picture. 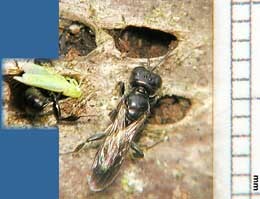 The small picture on the left shows a captured insect being taken into the burrow. The wasp is very similar to Crossocerus palmipes, although my insect guide says that that species nests in sandy places. Its prey seems to be a capsid bug. 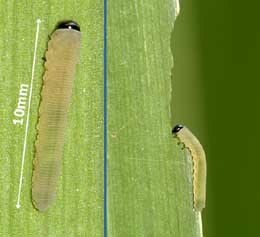 24 June - Back on the 16th I pictured this larva on an Iris leaf when it was about 10mm long (right-hand image). 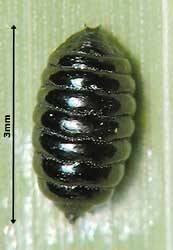 By today it has grown to about 16mm long, is darker and has raised white markings.